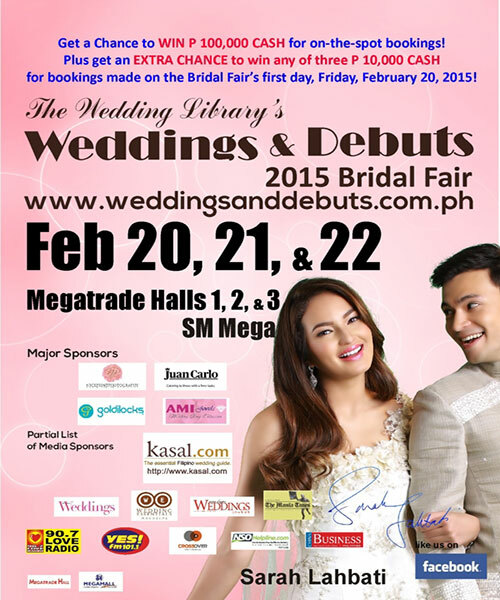 You can have a chance to win cash prizes when you attend The Wedding Library’s Wedding & Debuts 2015 Bridal Fair. Happening from February 20, 21, and 22, at SM Megamall Megatrade Halls 1, 2, and 3, this event will feature over 350 wedding suppliers from all over the country. Apart from attendees, exhibitors and employees also have the chance to win cash prizes during the “Pag May Tiaga, May Nilaga” promo. By attending the event and encouraging clients to visit their booths and make bookings on the spot, exhibitors and employees can get a chance to win any of the cash prizes worth P200, P500, P1000, and P5000. Three grandwinners will get P10,000 each.